The Stirling Smith Art Gallery and Museum opened a discussion as to whether the ambiguous location of this painting could be the Santuario Santa Rosalia in Italy, based on the composition’s resemblance to modern photographs of the interior of the cave system. Kieran Owens queried this initial suggestion, comparing it with R. Brandard’s 1840 steel engraving Shrine of Santa Rosalia on Monte Pellegrino and concluding that the two bear very little resemblance to one another. This led Owens to propose as an alternative location the Sanctuary of Saint Michael the Archangel in the cave system at the village of Saint Angelo a Fasanella, which is in the mountains about 50 miles south-east of the city of Salerno. 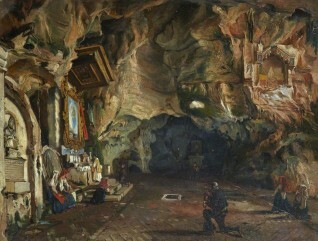 This was based on similarities he noticed between the clothing worn by the figures in the image and typical folk costume of the Salerno region, as well as parallels he drew between Smith’s painting and a drawing by Achille Vianelli that depicts an almost identical perspective of the cave system. This interpretation was furthered by Martin Hopkinson, who expanded on Owens’ suggestion that Smith and Vianelli may well have travelled together in Italy alongside fellow artist Giacinto Gigante, by recommending the comparison of Smith’s work to the pencil drawings of the Gigante brothers. Based on this conclusive evidence, group leader Andrew Greg recommended that Owens’ identification of the location of the painting as the Sanctuary of Saint Michael the Archangel be accepted, with both Art UK and the Stirling Smith Art Gallery and Museum agreeing to amend the title of the work. Could this be the Santuario Santa Rosalia?